March 20th Solar Eclipse / Vernal Equinox – A Powerful Astrological New Year! Hello everyone and welcome to Eclipse Season! We experience a series of Solar and Lunar eclipses about twice a year. The time period around eclipses is often referred to as “eclipse season” by astrologers because the effects generally can be felt in the weeks surrounding these events. Eclipse season can be identified by heightened emotions, restlessness, a feeling that change is coming without knowing specifics, a desire for a new start and the realization that some things in your life need to go. For adults, it can feel a lot like adolescence again. Angst, rebelliousness, confusion and a need to find our true direction can all be hallmarks of this “season.” The eclipses shake us up and wake us up from any complacency or denial we may be lost in. We’re not supposed to feel content because it’s a time to recognize what we need to do differently and hone in on what we truly desire. Eclipses set the tone for the coming six months and can reflect a continuation of work begun during eclipses six months ago. For example, the Solar Eclipse coming up on March 20 can be a time to evaluate anything you started around the Solar Eclipse on October 23, 2014. On a large scale, eclipses occur in cycles of approximately 19 years. For those of us who have been around at least a couple of decades, it can be useful to look back to the last time the eclipses were lined up along Pisces and Virgo. For the upcoming March 20th eclipse, think back to the spring of 1996. What themes were you dealing with in your life? What changes began around that time? This could be a chance to see the progress you’ve made since then and find a valuable use for the wisdom gained in your journey from then to now. Some things I remember from that era: running my first marathon (the LA Marathon), starting a job as an Art Director for a weekly newspaper (a job which I had no prior experience in) and feeling inspired about the saxophone after going out to see Big Bad Voodoo Daddy, a local band that had yet to burst on the national scene. Now, I’ve retired from marathons, but have had the satisfaction of 10 marathons to my name and have learned so much about my body from the years of training. I’ve been through an entire graphic design career and spit out the other side and instead of dreaming about the saxophone I have spent the past 16 years learning to play and am now in a great local Portland band (that has yet to burst on the national scene). I’m quite excited about the launch of this next 19-year cycle in my life! So all this eclipse talk would be interesting enough, but we get the double dose of “new” energy because this Solar Eclipse lands on the Vernal Equinox. Here’s how it will go down: the Solar Eclipse will occur at 29 degrees, 27 minutes of Pisces at 5:36 a.m., Eastern Daylight Savings Time. Then, at 6:45pm, EDST, the Sun moves into Aries, marking the Vernal Equinox and what is celebrated as the Astrological New Year! The occurrence of a solar eclipse on the Vernal Equinox is quite rare – the last time this was experienced was 353 years ago on March 20th, 1662. It’s safe to say this is a once-in-a-lifetime event. If you have a birthday on March 20th, this year is scheduled to be life-changing. The way you can make the most of this power-packed time is to first recognize that it is happening. Trying to hold on to the status quo and resist change will be the least advantageous approach and could result in undesirable outcomes. Instead, try to get excited about change. I realize that this does not come naturally for everyone. But, imagine you have an over-stuffed closet and the only way to include some of the cool new items you want to buy is to clear out some of your old things. Think about what new beginnings you’d like to cultivate for the coming year. 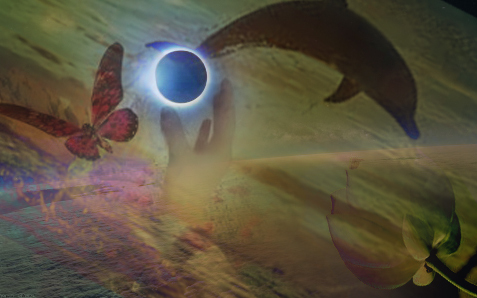 With this eclipse in the last degree of Pisces, themes of creativity, forgiveness, releasing addictions and trusting in a higher power will be prominent. Check your March horoscope here for more information about how this month’s eclipse will affect you. We’ll get our second of the eclipse “pair” on Saturday, April 4 – a Lunar Eclipse in the sign of Libra. Relationship issues will take center stage here. Time for some realizations about achieving balance and establishing more fairness in dealings with partners (romantic or business) and friends. Stay tuned to this blog for more information. Happy Eclipse Season and Astrological New Year to you all. Remember, change is not only necessary and good for us – it’s also inevitable so you might as well work with it.